The next Marin Green Drinks FREE monthly business mixer is on September 11, 2018 from 5:30 PM - 7:30 PM. AD10 candidate Dan Monte supports healthcare for all and the Healthy California Act (SB562). Come and discuss how we can have Guaranteed Healthcare for All Californians. 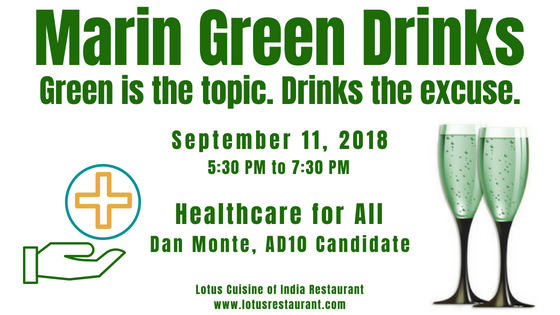 You'll also get a chance to mix and mingle with North Bay green business folks and enjoy organic food, beer and wine at Lotus Cuisine of India.